The broadcasting legend is totally over Kanye's never-ending feuds. By: Kyle MacLelland, Producer "Larry King Now"
Having worked for Larry King coming on four years now, I've grown to truly admire his incessant curiosity about such a wide range of topics. The King's decades-long, quick hitting "how, what, where, when, why" style has made him a talk show icon and kept viewers coming back for more, whether on the radio airwaves, cable TV or the internet. With that said, I don't know if I've ever seen him show blatant disinterest in a topic throughout all my years of watching CNN and producing for Ora TV — until now. Larry recently welcomed another longstanding broadcaster — Ms. Wendy Williams — to the Larry King Now hot seat. The two dished on a slew of topics, including politics, dream guests, and even heart health (LK and WW are both advocates for improving heart health in America). 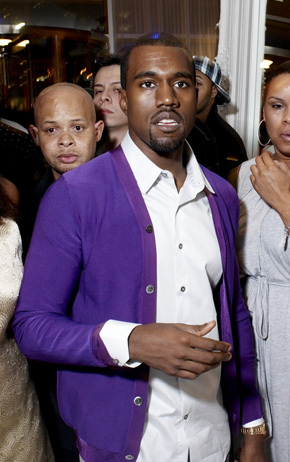 At one point during the discussion, Larry brought up the recent Kanye West, Amber Rose twitter feud — something he had vague knowledge of prior to the chat. Upon pressing Wendy — known for her keen sense of pop culture trends — about the story, it suddenly became very clear that Larry, in hilarious fashion, couldn't be bothered by Kanye West and his perpetual drama. And, coming from a man who has interviewed everyone from Jackie Robinson to the Dalai Lama to Ronald Reagan (well, for that matter, every president since Nixon), I think it's fair to say Larry's "this doesn't matter" moment was totally warranted. So, if you're causing a guy who's built a globally respected career off of his immense curiosity to yawn...it might be time to reevaluate some things, Mr. West.